Delightful Repast: Cauliflower Macaroni and Cheese - Sneaky, Huh? Sneaky Macaroni and Cheese is what I call this recipe when young picky eaters are on the scene, but I just called the post Cauliflower Macaroni and Cheese 'cause we're all grown-ups here, right? There's a serious amount of cauliflower in there, but can you even see it? See what I mean ... sneaky. I thought I should make a comfort food classic like macaroni and cheese this week because ... drum roll, please ... this week is my Second Blogiversary as a blogger of comfort food! Should have had a cake for the occasion, but I wasn't in the mood for anything sweet. Help me celebrate by following Delightful Repast and telling your friends about it: Stumble it, Pin it, Tweet it, whatever. Do you have a picky eater in the house? Do you ever "disguise" vegetables in a sneaky way? Do leave a comment and tell me your best tips. And put a little cauliflower over on your picky eater! 1 In large pot, at least 5 1/2 quarts (I use Le Creuset Enameled Cast-Iron 5-1/2-Quart Round French Oven), bring 4 quarts of water to a rapid boil. 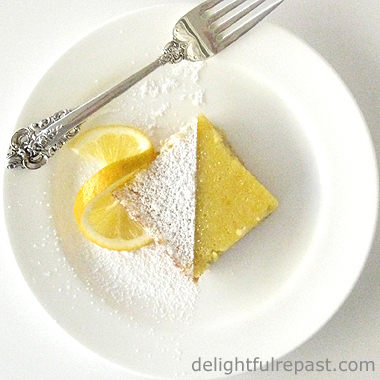 Lightly butter a 13x9x2-inch baking dish or two smaller, shallow baking dishes. 2 About 5 minutes before adding the macaroni to the boiling water, preheat oven to 375 degrees and start sauce. In 3-quart saucepan, heat butter until foaming but not browning. Add flour, salt, dry mustard, pepper, red pepper flakes and cayenne; whisk for about a minute. Gradually whisk in milk and cream, whisking or stirring constantly until mixture slowly comes to a full boil. Reduce heat and simmer, stirring occasionally, for about 7 minutes. Remove from heat and let cool slightly for 2 minutes. Gradually stir in cheese. 3 Meanwhile, add macaroni and salt to rapidly boiling water; cook for 3 minutes less than the maximum time specified on the package. Add cauliflower to the pot for the final 3 minutes. 4 Drain pasta and cauliflower in colander; return to pot. Add cheese sauce, and stir until well combined. 5 Pour into prepared baking dish(es). Bake at 375 degrees for 30 minutes, or until bubbly. Let stand 5 minutes before serving. This looks delicious! With the cauliflower cutting the carbs in half, I think this just might go over with my wife. I have to say, I love broccoli but I've never been a big fan of cauliflower. But covered in cheese, it might be delicious! Thanks, Richard! Yes, give it a try. It has just as much cauliflower as macaroni by volume, and you won't even know it's there! Aaargh! Is this the 6th or the 7th Circle of Hell? Oh, my sins and the consequences are manifest now! I get it. If I don't change my ways, I will have to eat HEALTHY for eternity. Gak. Yes, I make the sign of the cross when I see cauliflower. I think the reason it cuts the carbs in half is because it's INEDIBLE! Alas, the minority view has spoken. Thank you for your time. Now I must go wash my mouth out with Coca-Cola. What are we going to do with you, Sully! I would have died of malnutrition at 30 on your diet! I'm not wasting this on picky kids! ;-) I love the idea of putting cauliflower (one of my favorites) in this dish. Okay, where's my Tinkyada. This looks like dinner tomorrow. Thanks, Jean! I like your attitude, Judy! I'm glad I put half a batch in the freezer, so I can have it again in a couple nights. 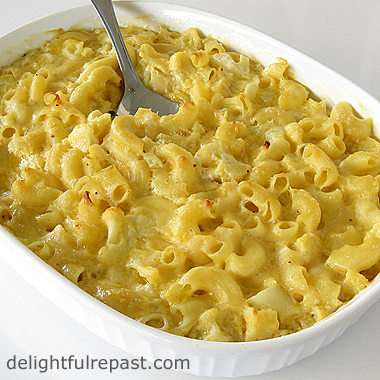 Jean, this cauliflower mac 'n cheese looks crazy good! Love how you snuck a veggie into one of the most delicious, indulgent dishes ever and made it a little more healthy. Thanks for sharing. You have a great blog! Thank you, Georgia, just a little spin on one of my favorite comfort food classics--something you love too, I know! Thank you so much! Hard to believe I've been doing this for two years! Truly, my husband had no idea this wasn't my usual macaroni and cheese. You really might be able to pull it off with unsuspecting children. Jean I love this recipe--and I love cauliflower! But I am hesitant to put my most beautiful 'fractal' cauliflower in this dish--better go get some of the plain kind. It's the time of the year for the most astonishing cauliflower to appear at the COOP--real name something like Fresca or romanesa---but I call it fractal. I like to pick off the smallest fractal I can find on it...each piece a perfect christmas tree shape. Do you know what I mean? I agree with richard s. with the carbs cut in half...this is a really great recipe for mac and cheese. Jean. I don't believe it!!! This is something that I COOK!!! But, however, sadly, and I must admit humbly, mine's not as good as this sounds. I boil some pasta, either Fusilli or the sort in your illustration. My mind has gone blank!!! 750g of the strongest grated Cheddar cheese and some chilli powder, medium to strong. I estimate the amount of milk I add to the cheese and heat it until it is melted. I bake it in the oven until I can see, through the oven window, that the whole think is beginning to brown on the top and is bubbling away. Thats it. The whole thing is done by estimation and LUCK!!!!!!! Susan, thanks. Yes, definitely go get some plain white cauliflower. You can't have "sneaky" macaroni and cheese with that bright and flashy Romanesco cauliflower! Isn't it cute?! Tony, it's fun to just throw stuff together. But if something turns out great, I immediately write down what I did, so I can duplicate it next time instead of trying to remember and never getting it quite the same again! My kids are not picky eaters, and they actually LOVE cauliflower. (It freaks people out at the grocery store when they're begging for onions, cauliflower and brussel sprouts). Your recipe looks awesome, will make it on to the grocery list for the week! Alison, thank you! And I'm so glad to hear your kids like vegetables. I always loved them as a child and never quite understood why anyone wouldn't! Thank you, Charles! I could never keep up your pace of blogging. My average is 59 posts per year, once a week like clockwork plus an extra from time to time. I love raw cauliflower too. And raw broccoli.